A concerned netizen recently posted on his Facebook account a security threat he personally experienced just this July. It all started when Ian del Yong Caballero’s, the person who posted his experience on FB, Globe sim card was suddenly deactivated on July 2. Upon inquiring to Globe’s customer service hotline, he was then informed that someone requested for a SIM replacement at their SM North EDSA branch. However, the said incident escalated when the perpetrator who got hold of his mobile number began accessing his e-mail addresses and other social media accounts through a security option most websites use these days called SMS Recovery Option. This option allows users to reset their passwords in case they have forgotten it or if there is a security threat by the use of their mobile number. Incidentally, Caballero’s multiple accounts were using this security feature, thinking it would indeed be an extra safety layer. Still, the opposite happened when he was booted off his own accounts. He was able to recover his accounts, though, by the use of an alternate email address which was not associated with any mobile number. 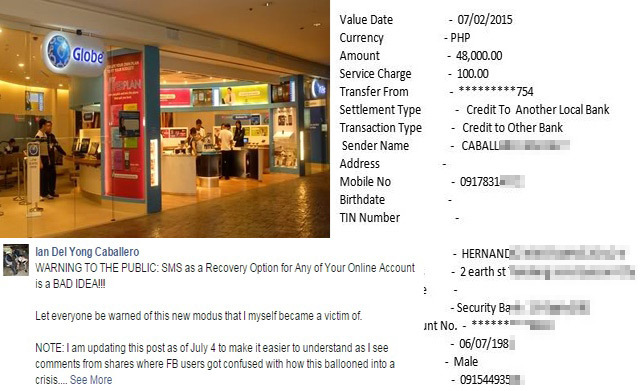 When he was able to gain access to his account again, he was baffled to discover an email stating that 48,000 pesos was transferred from his BDO account to a certain KristianneZoilo Hernandez. It turns out that the culprit used his email to access his bank account online. Caballero has proceeded to the concerned Globe branch where the SIM replacement took place to request for a copy of the CCTV footage of the person responsible but there was none released as of this writing. After the post was gaining attention online, more people who had been victimized by the said modus also came forward. It is still not clear, though, if such modus involves an inside job or was just some random incident.